This snippet is by Petri Leskinen (pixelero). 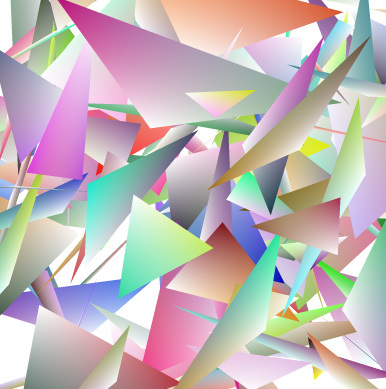 It draws a triangle with a gradient fill of three colors for each vertex using Graphics.drawTriangles and a BitmapData of size 2x2. This is the simplest case, it can easily be extended to four colors or maybe to use a larger 3x3, 4x4 etc... bitmap. I started ActionSnippet last year in October. Excluding the last few months I posted pretty much everyday... resulting in about 350 posts including this one. If you haven't spent time looking at some of the early posts... I recommend digging around as there are lots of very compact tips and tricks... have a look (scroll down for early posts). For at least the next two months I'm going to post at least twice a week rather than the original every day... that said, I think it would be nice to post additional ActionScript snippets submitted by readers. This has actually been something that numerous people asked me about when the site first went online. So, if you have a snippet you'd like to submit you can simply e-mail me (bendvent  gmail) with the subject line "AS3 Snippet". You should include your full name, link to your website and any other information you would like to be published along with your snippet.... this can include anything from links to work you've previously done... to references related to the snippet your submitting. The snippet you submit should ideally be less than 30 lines of code, but can be as long as 100 lines. This snippet submission process will go on for the next month and will end November 1st. On November 8th one of the people who submitted will be chosen as the winner and can choose from either a $300 apple gift certificate or a $300 deposit to their paypal account. If you send me a snippet that already exists on the website I'll e-mail you back and let you know that this snippet is already on the site. If you send me a snippet that doesn't make any sense, has errors etc... I may not reply at all. If you send me a snippet that I would like to include on ActionSnippet, I will e-mail you back to discuss things that we will include in the post. Only snippets that end up as blog posts on this site will be considered for judging. Since ActionSnippet is a pretty low traffic site, I'm not expecting for there to be too many submissions, but it would be cool if people who like this site attempt to help spread the word by tweeting and blogging about this contest. If you have any questions feel free to post comments. I have a feeling that I may need to clarify a few things about the contest. After the contest is over I may decide to run another contest or create a snippet submission page.... my decision will be related to how well this contest goes. Currently I'm the only judge for the contest... but there will be at least one other judge announced in the next day or two. You can submit as many snippets as you want... you aren't limited to just one... and if I like more than one of your snippets you will get multiple blog posts on the site.